Chompie’s Cares about the community of which it has been a part since 1979. Every year, Chompie’s donates over $100,000 to various non-profit organizations. Here you will find information on the various Chompie’s Cares programs available and some of the community programs we support. Raise funds for your non-profit organization through a Chompie’s Cares Dining Event. 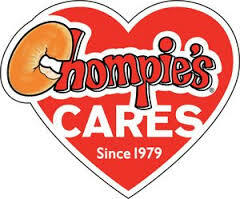 When your organization promotes and holds a Chompie’s Cares Dining Event at Chompie’s, 15% of the proceeds from the event attendance will be donated back to your organization. A Chompie’s Cares Dining Event can be scheduled for a weekday (subject to availability) at a specified time period for your entire group (group size limitations may apply). Members of smaller groups may dine-in individually at their leisure during the designated time period. Chompie’s accepts requests for gift cards and gift certificates for non-profit organization silent auctions. Chompie’s has provided hundreds of thousands of bagels for various charitable events over the years. You may request the discounted purchase of Chompie’s bagels or bakery goods for your non-profit organization’s event. You can raise funds for your non-profit organization by organizing a Chompie’s Cares Gift Card Fundraiser. Your organization sells Chompie’s Gift Cards ($25 each) to your members and earns a profit of $5 for every $25 gift card sold. Your organization promotes the following: "Order Chompie’s $25 gift cards through (name of your organization/fundraiser) from (date) through (date). (name of your organization) will earn $5 for every Chompie’s $25 gift card purchased by (name of your organization) during that time." That’s $100 earned for every 20 gift cards purchased! Your organization gathers the orders and the payment for the gift cards from your members. Your organization then purchases from Chompie’s corporate office at a 20% discount ($5 off each $25 gift card) all of the gift cards your members have pre-ordered and pre-paid for, earning your organization a profit of $5 for every $25 gift card sold. Your organization distributes the purchased gift cards to those who ordered them. Please complete the form to make a "Chompie’s Cares" request for your non-profit organization. Due to the high volume of Chompie’s Care requests received, we kindly ask that you provide us with at least sixty days advance notice. Thank you. Kids 10 and under eat FREE all day Tuesdays! Add a free "Eggciting Breakfast." to your calendar and come to Chompie’s on your birthday. THANK YOU for helping Chompie's support our friends and families in need in our communities!